BOSTON, Dec. 3, 2018 /PRNewswire/ -- At a seminar held on November 29th at Boston University's School of Medicine Healthcare Emergency Management Program, scientists Drs. 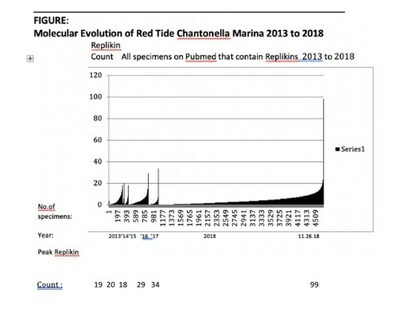 Samuel and Elenore Bogoch, principal researchers at Replikins, Ltd., announced that rapidly replicating Red Tide dinoflagellate deadly 'blooms' have been found at p<0.001 in 2016 and 2017 to contain two years pre-outbreak increasing highest concentration range of lethal Gene Replikin peptides. This highest range of Replikin Counts (number of Replikins per 100 gene amino acids) was found elsewhere only in disorders with the highest five-year mortality rates. A new automated quantitative method has been developed to survey, in advance of outbreak, lethal gene structural conservation, mutations, and rapid replication. Joint work* on advance detection provides time and gene structures for pre-outbreak countermeasures. Rapid replication has been found to be associated with a newly found family of strictly specified gene peptides, named Replikins, characterized by gene peptides 7 to 50 amino acids long, containing a minimum of two lysine groups, 6 to 10 amino acids apart, a minimum of 1 histidine group, and a minimum concentration of 6% lysines. (Replikin Count = number of gene Replikins per 100 amino acids). This invariant definition of Replikins, over the past 18 years, has resulted in the development and validation of automated, quantitative, objective, proprietary software (Replikins Gene Surveillance™). Using this software, a markedly increased concentration of gene Replikins has been found to be associated at p<0.001 with outbreaks of high lethality disorders, the latest and most prominent of which is Red Tide.